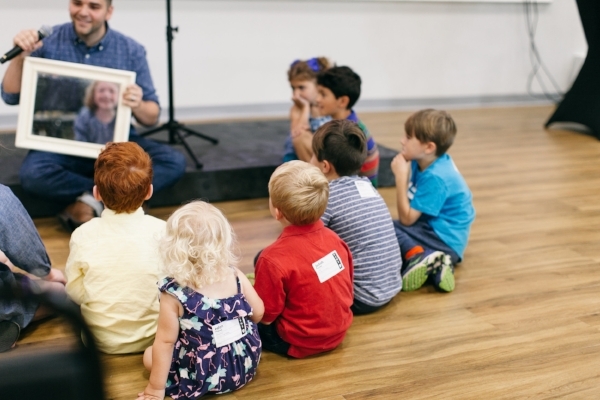 Your kids will enjoy learning about Jesus with friends at Seven Mile KIDS. Join us for Sunday Church Services at Seven Mile Road Church, a Christian church in Waltham, MA. Your kids will enjoy learning about Jesus with friends at Seven Mile KIDS. We currently have 2 "Kid's Church" groups available (1-4, and 5-8) with age-appropriate activities and learning. All of our volunteers are interviewed and background checked (National and State - CORI) to provide a safe and fun environment. Kids are "checked-in" before the service, where they are registered and receive a name tag. Kids attend the first part of the Sunday Gathering with their family to begin to build rhythms and memories of worshipping with their family. They are dropped off to their class immediately following the Kid Sermon and are picked up at the end of the Sunday Gathering. We use the Gospel Story Curriculum to help our kids understand that the Bible is one story with Jesus as the hero. From Genesis to Revelation, the curriculum focuses on the the major passages of Scripture that tell the story of redemption. For more information about our policy, procedures, and philosophy of ministry, check out the Seven Mile Kids Handbook. If we can answer any questions about Seven Mile Kids, or talk about our policy, procedures, or philosophy of ministry, please let us know. We would love to start a conversation.